In addition to droppings, chewed holes and unsightly smudges, the distinctive, ammonialike smell of mouse urine serves as one of the key indicators of rodent infestation -- male mice use their odorous urine to mark their territory and keep track of established routes. Unlike other symptoms of infestation, however, this unpleasant odor lingers even after you eradicate the pests. 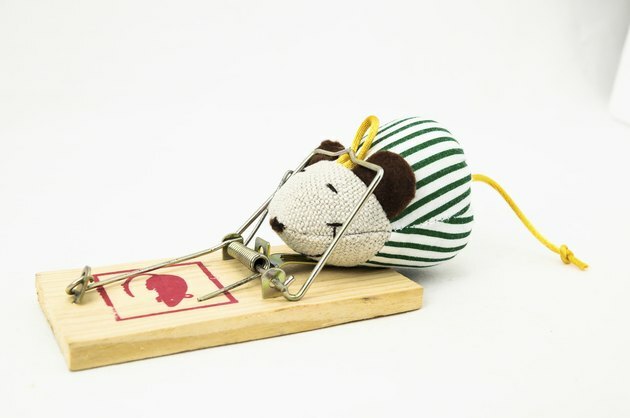 To reduce the nose-wrinkling smell of mice in your home, you must first eliminate the infestation, then implement a multipronged odor-reducing approach. A combination of odor-control techniques and the passage of time causes mice-related smells to fade. Equip yourself with rubber or plastic gloves, a face mask and work goggles when working to remove mouse-related odors. These items help protect you from harmful bacteria, fumes and potentially harsh chemical ingredients. Increase the air flow in your home as much as you can, both during day-to-day life and -- most importantly -- during cleaning. Open all of your windows and external vents and run fans where possible. This helps dissipate odor and reduce fumes during cleaning. Spray any dead rodents, droppings or nests leftover from the infestation with a household disinfectant, soaking the debris thoroughly. Place the debris in a plastic bag and seal the bag, then bury the bag in an outdoor hole that is at least 2 to 3 feet deep. Mop hard floors with a combination of household disinfectant, household detergent and water to help reduce rodent odors and prep hard surfaces for the application of other odor-reducing products. Wipe down hard surfaces -- such as cabinets, solid furniture and countertops -- with a solution of household disinfectant, household detergent and water. Likewise, apply pet stain and odor remover to any external areas commonly traversed by mice during the infestation. Bio-enzymatic pet odor removers help break down the urine that causes the smell. As an alternative, wipe these areas down with white distilled vinegar. Spread granule-type pet odor removers in out-of-sight places away from pets, food or small children, such as garage cabinets, basement storage areas or attic crawlspaces. Place scented fabric softener sheets in these areas to help freshen the air. Spray airborne odor eliminator in any areas affected by mouse smells regularly. Unlike fragrance sprays, these pump-style sprays remove odor on contact rather than simply masking the scent. For optimal safety, turn to nontoxic, biodegradable spray odor eliminators. Launder any textiles potentially affected by the infestation. For optimal odor removal, allow them to air-dry on a sunny day. Wash your hands and face thoroughly with water and antibacterial soap after treating your home for mouse-related odors.